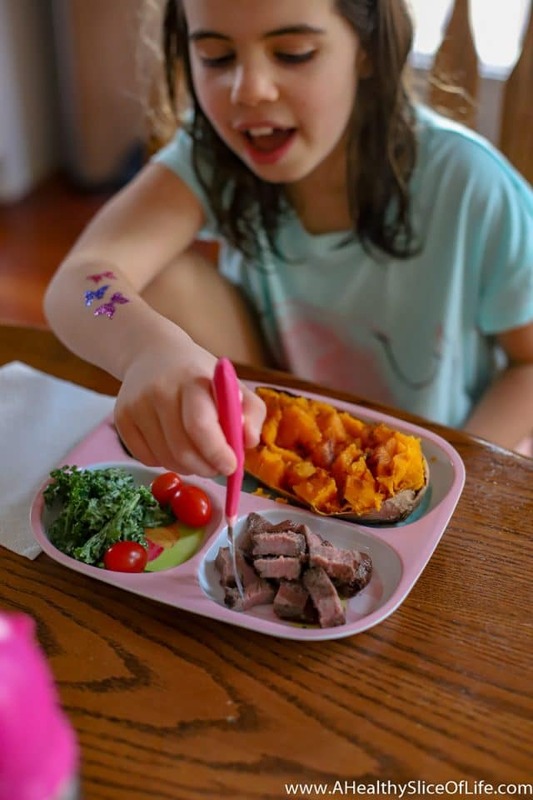 I don’t take pictures of every meal I feed the girls because we eat a lot of repeat meals, they don’t always look all that pretty, and we definitely have the days where pb&j with sliced apple is lunch- and I’m willing to bet you have that meal mastered as much as I do! Sous Vide flat iron steak (I get all our meat from Butcher Box now unless I run out), avocado kale Caesar salad, tomatoes, and a baked sweet potato with butter, cinnamon and honey. 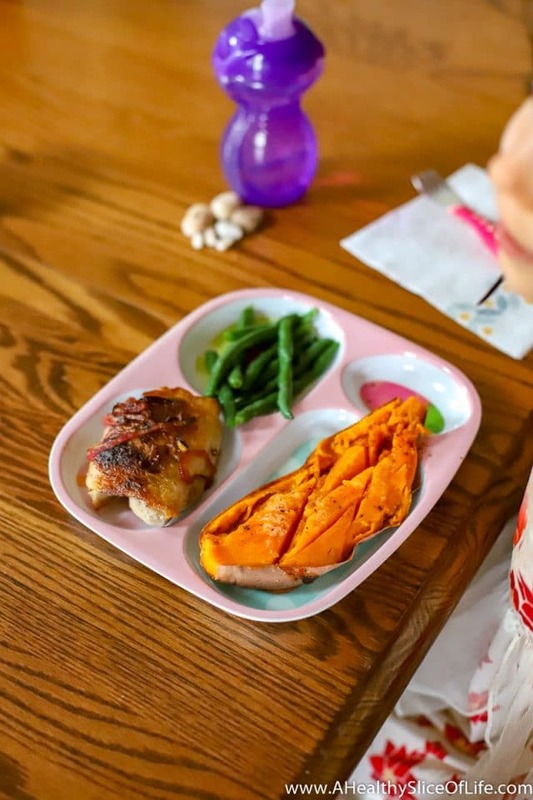 The kids go bonkers for the sweet potatoes done this way (I wonder why…) so we’ve had them a lot lately. 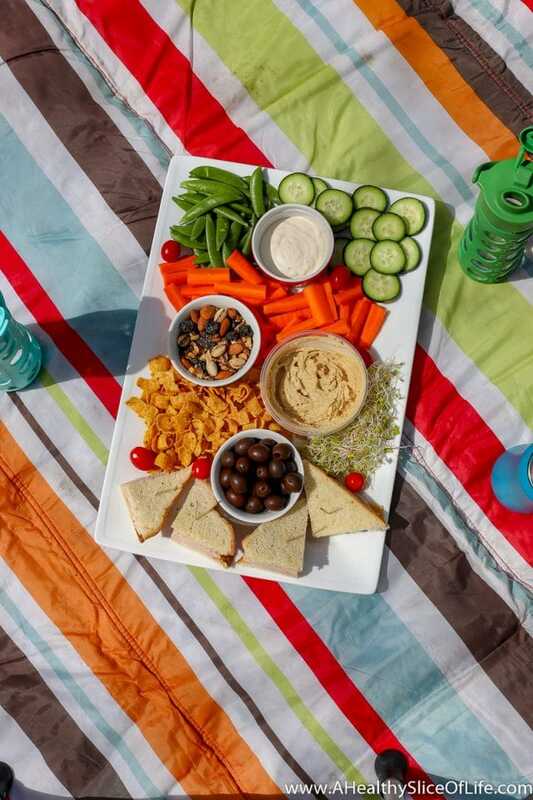 Picnic snack plate. Ham sandwiches, olives, the end of a bag of corn chips, mixed nuts and dried fruit, hummus, veggies and ranch. I add the sprouts on there to fill up an empty spot. Hailey will eat them on sandwiches but both girls balked hard at seeing them on a snack plate- lol! 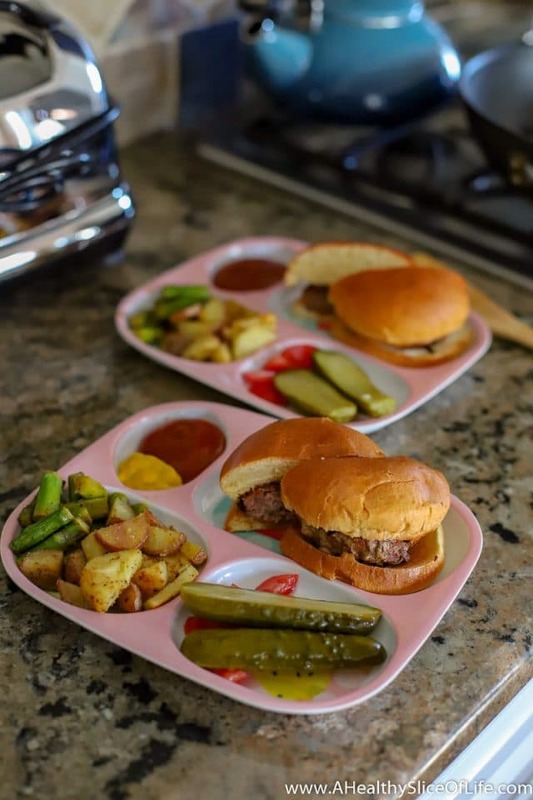 Burgers on brioche buns, dill pickle, grape tomatoes, roasted golden potatoes and roasted asparagus. Kaitlyn still reminds me every time I serve this that she doesn’t like asparagus (I must keep “forgetting”), but she still usually eats a piece or two. Crowd-pleaser! Taco night buffet (you-choose). 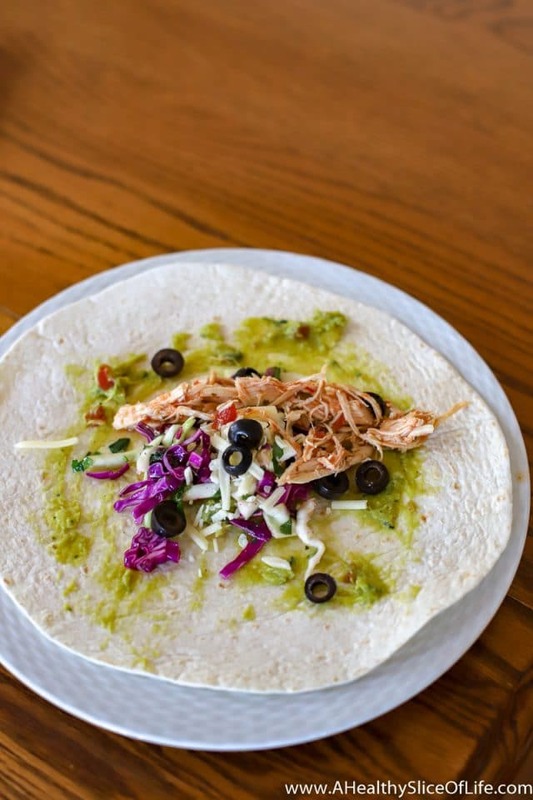 Tortilla, guacamole, cabbage slaw, salsa chicken, shredded cheese, black olives, and cilantro. She opted to leave off the sauteed veggies, the purple onion, sour cream, and salsa. Salad buffet dinner- same choose your own concept as taco night. 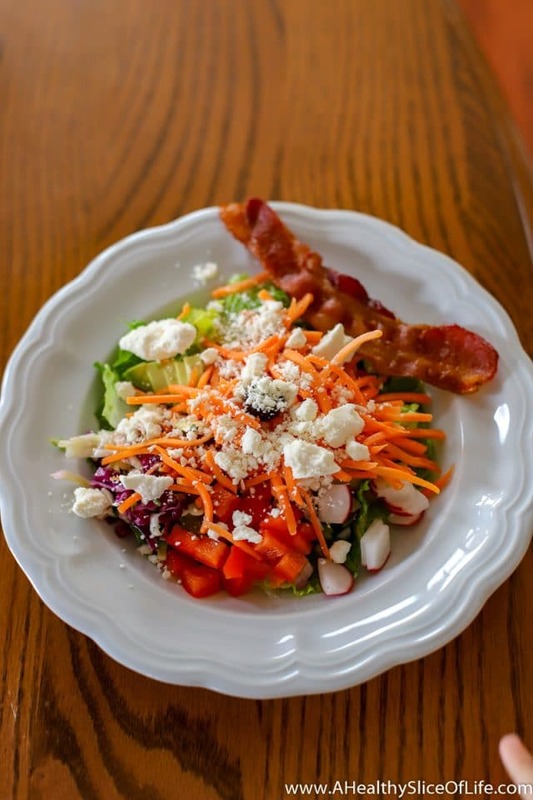 Romaine, radishes, tomatoes, purple cabbage, shredded carrots, feta, slice of bacon. Topped off with ranch dressing, then Garlic Expressions dressing for round 2. Pulled pork tenderloin (in the crockpot for 4 hours with sauerkraut and Italian seasonings), pan-fried Brussels Sprouts, baked sweet potato with walnuts (and again- butter, cinnamon, and honey). Neither kid ate the kraut. I have spoiled them with the garlic dill pickle variety. Snack plate! It really is our go-to lunch. 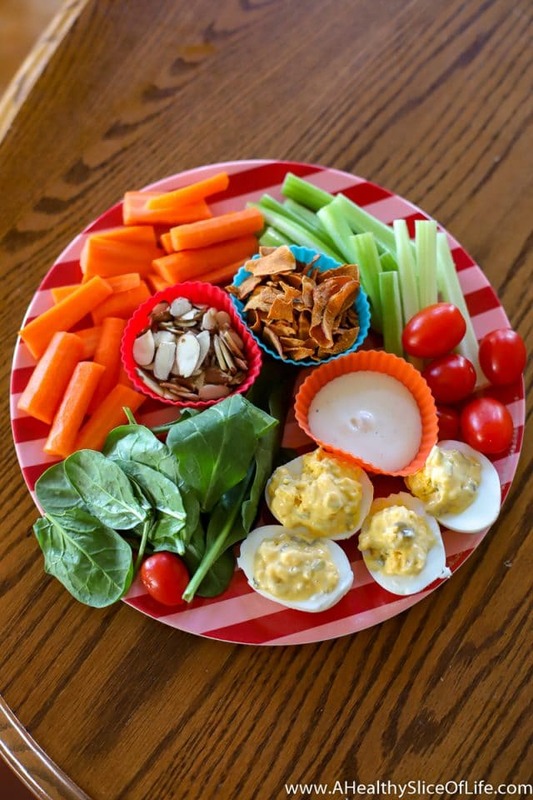 Veggies and ranch, quick deviled eggs (kid fav), slivered raw almonds (neither one was a fan), and sweet potato chip remnants. 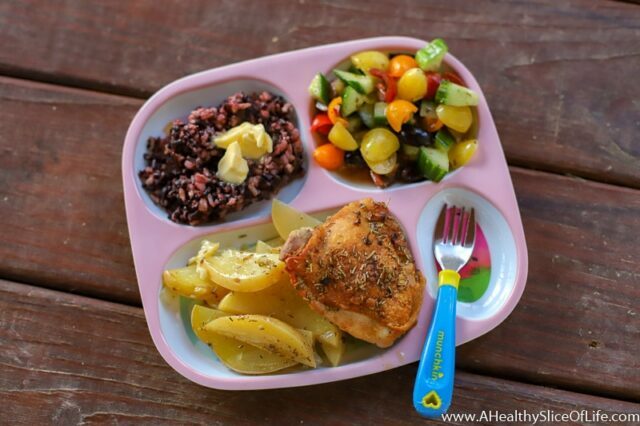 Greek Chicken and Potatoes, cucumber, tomato and olive salad, wild rice blend with butter. We are on a chicken thigh kick right now because they have SO much more flavor. I pan-sear the thigh for about 4-5 minutes per side, then finish them in the oven. My non-meat lover Kaitlyn is even loving them (as long as I peel off the skin). Breakfast of champions. Organic strawberries have been on sale at great prices at Whole Foods, so I stocked up. 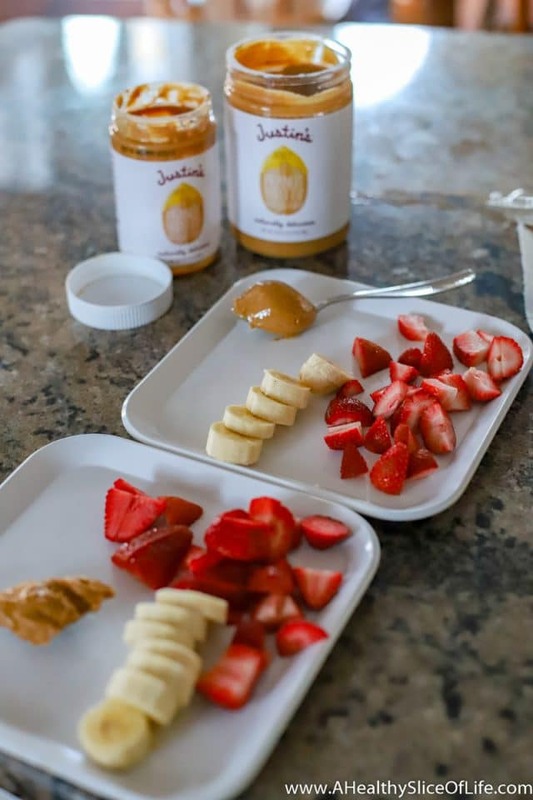 Add banana and a scoop of Justin’s honey peanut butter and viola- breakfast that everyone loves. 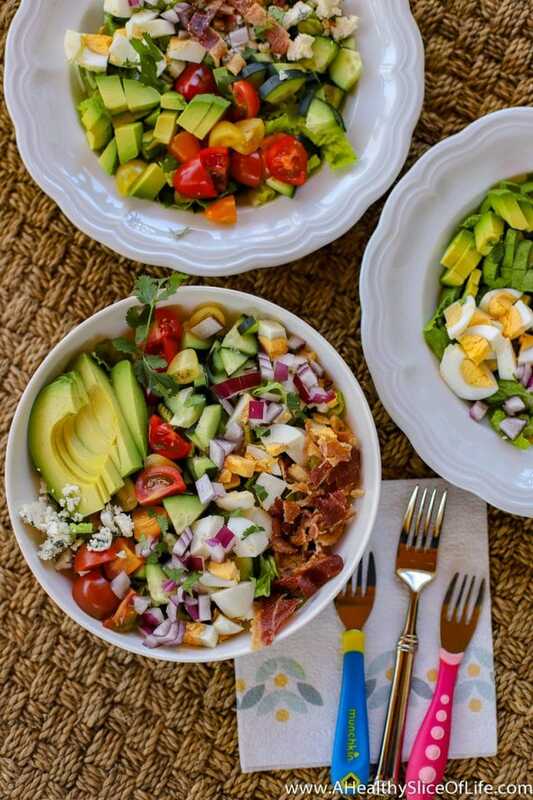 Cobb salads. I let Hailey choose lunch last week and her request was “salad with bacon.” I layered romaine, cucumber, red onion, tomatoes, boiled egg, avocado, bacon, and a little bit of blue cheese. We all devoured them! Simple, marinated baked chicken wings, asparagus, avocado, corn on the cob, and apple slices. The girls are super excited to see corn starting to appear on the plates again. I usually save it for summertime outdoor eating because it’s messy, but oh so good! Cereal and oat milk. Just as I let Hailey choose lunch, I let Kaitlyn choose breakfast. Chocolate on chocolate and what a surprise- they girls loved it (insert eye roll ;)). 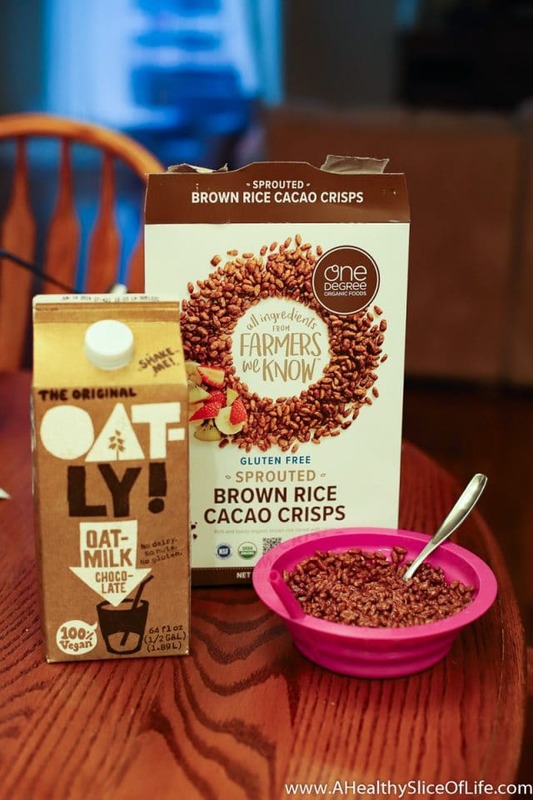 I liked this cereal because of its simple ingredient list and sourcing (see all the details on it here). Oatly is a brand I’ve been wanting to try, and I can vouch that the chocolate version is delicious! I’ve used a couple splashes in my lattes. Chicken Thighs with Oregano and Lemon, simple green beans, and baked sweet potato with butter, honey, and cinnamon. Like I said- chicken thighs and baked sweet potatoes. We can’t get enough right now. If you like seeing these posts for meal plan ideas, I highly encourage your to check out my meal plan archive. I have over 22 pages of meal plans with recipes links, pictures, and feedback. I also share which recipes I make each week with feedback on my weekly newsletter, so sign up here if you haven’t already! 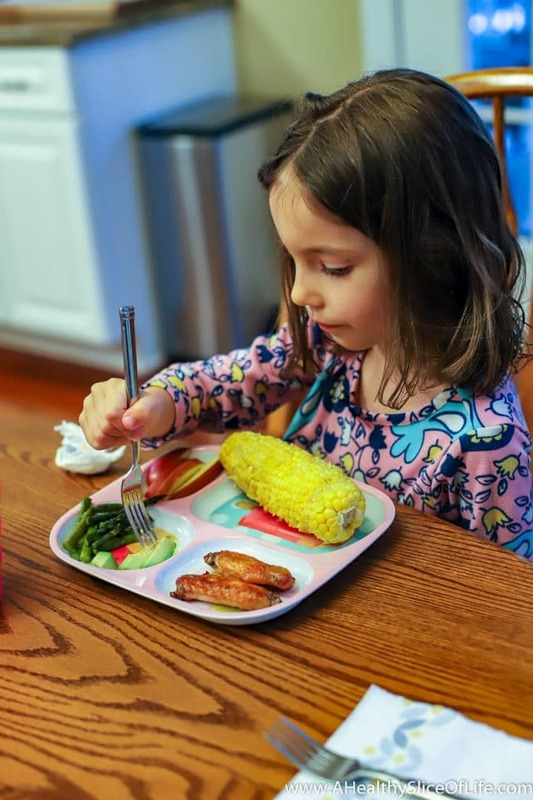 Are you or your family on a new-favorite-food kick lately? What can’t you get enough of? Looking forward to tasting some of these fine morsels, plus fun family time, this weekend! John J. Stathas recently posted..You Can Change That Undesirable Feeling! Roasted radishes- that is awesome! I’ll have to try them! I love your age specific posts because I save them in Pinterest! No kiddos for me yet, but at least I’ll have a little guidepost for ideas when the time comes! Thanks for the meal ideas, Brittany! How do you cook your sweet potatoes? Every time I make them, I’m the only one who eats them! I will try the butter, honey, and cinnamon idea though; that should help. We are into suuuppper simple meals around here lately. Last night, we got home right before dinner, so I threw beans, peas, instant rice, salsa, and chicken stock into a pan and heated it through. My kids are young (4 and 2), so they don’t know any better. 🙂 They gobbled it up. I can promise the butter, honey and cinnamon make anything delicious, but I just scrub mine, stab them with a fork and bake them at 400 for 1-2 hours, until soft. 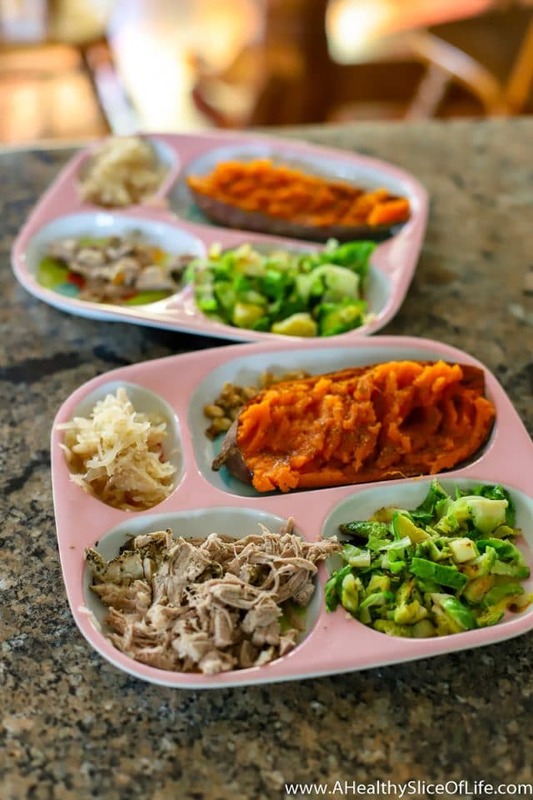 We have been in a major food rut lately, thanks for the new meal inspiration! Thanks for the info! Yes, one-pan meals are the best and save so much time in the evening clean-up. I’m Greek, too! 🙂 Hope the sweet potatoes work as well for your crew as they do for mine! Oh nice 🙂 We live in Columbia, SC and unfortunately don’t have any real Greek restaurants. I know Charlotte has many so we’ll have to visit more. In case you haven’t made this before here is an easy and healthy recipe you might enjoy! Only change is don’t increase the heat in the end, keep it low!